Arundhati Roy refused the Sahitya Akademi award. Mahasweta Devi is 'overwhelmed' by the Padma Vibhushan. One takes pride in being called a writer-activist, the other says the term makes her flinch. Mahasweta Devi is "overwhelmed" by the Padma Vibhushan. Well, she’s getting on in years, isn’t she? Having crossed 80 winters now, this lifetime-activist-writer is likely to look at national awards a little more benignly, even awards that are distributed so freely (the Padma awards are up this year to 106 from 96 last year and 86 in 2004) by a state that habitually represses dissent and protest in any form and sits on the fence on controversial globo-political issues like big dams and Iraq and Afghanistan. But wait, what have we here? Mahasweta also told a journalist, who first informed her of the award (not a state official), that there were other people more deserving and also that she’d "like the same amount of cooperation from the government to help achieve [her] objective of ensuring the welfare of tribals". Not one to mince words even at 81, is she? In fact, the recent furore over Arundhati Roy declining the Sahitya Akademi award (non-fiction) must seem embarrassing for Mahasweta, who’s got a bagful of them. She received the Akademi (for fiction, Aranyer Adhikar) in 1979, Padmashree in 1984, the Bharatiya Jnanpith in 1996 and the Magsaysay in 1997, the officer desarts et des lettrea (officer of arts and literature), France's second highest civilian award, in 2003. And now, the second highest civilian award, the Padma Vibhushan from a government that she thinks has not only not done anything for tribal people but also evicts them with alacrity whenever it needs a piece of their land. 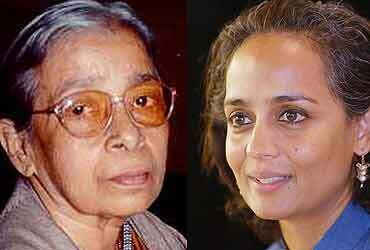 The comparisons between Arundhati and Mahasweta are inevitable. Both work for the voiceless people and have a large body of non-fiction, and both are known as writer-activists, though one likes to be so addressed and the other says the term makes her flinch. And yet, it is one of those ironies, that while one's activism makes the waves, the other soldiers on, away from media spot-light. Every one perhaps works differently for the causes they espouse. Some seek to bring attention to them by stirring up a debate in the media and some go out of their way to stay away from the limelight so that they can carry on with the work they have chosen to do. Arundhati’s opinion of the Akademi may or may not be justified. But it is definitely shared by many including the half a dozen writers who have refused an Akademi award in the past. Perhaps even by Mahasweta. But then, Mahasweta wouldn’t believe in passivity or rejection, but action. She herself had no objection when a band of Left-leaning writers put up her name as a presidential candidate for the Akademi three years ago. She lost to Gopi Chand Narang who claimed his election as a victory of "real secularists over pseudo-secularists". U R Ananthamurthy, one of her leading supporters, said later that Mahasweta put her name up only "to defend the freedom of writers. These are difficult times (the BJP rule) and she would have taken a principled stand". As she had herself said in 1997 talking to us: "These are difficult times, these are the times to work." And she worked behind the scenes, getting prominent citizens to intervene and write to the President when Gujarat burned in 2002. Indeed, Mahasweta’s life gives lie to the award-snobbery that exists among intellectuals all over the world; the belief that awards, especially state awards, are politically motivated and mostly go to the undeserving. Gujarati litterateur Suresh Joshi felt Sahitya Akademi award had no cultural value. Sisir Bhaduri, doyen of Bengali theatre, had refused the Padma Vibhushan citing two reasons. The first was on principle: he felt state awards merely help create a sycophantic brigade. The second was personal: by accepting, he did not want to encourage the impression that the government was serious about the importance of theatre in national life. Probably the most controversial event in Jean Paul Sartre’s very politicised and exciting life was his refusal to accept the Nobel awarded by "the bourgeois society". Yet anti-bourgeois or communist sentiments are not enough to be disdainful of awards or even, as painter Claude Monet wanted, "to be really undeserving". Mikhai Sholokov called the Nobel an imperialist award when Boris Pasternak was named (he refused), but didn’t have any problem accepting it when he himself was awarded with it a few years later. The Magsaysay award carries a lot of prestige in Asia and has gone to some very genuine names who obviously don’t associate the award with Ramon Magsaysay, the former Philippine president who had brutally put out a farmers’ movement with US help. In the media hullabaloo that has followed Arundhati’s refusal, it is important not to lose sight of the real issue: it is not who rejected (a beautiful and intelligent woman who earned one of the biggest advances in publishing history and likes to court arrest), but why. What writers hold dearest is their freedom of expression and Roy deserves respect for standing up for what she believes in. It’s a choice that she has made. Fortunately, unlike the tribals and the dispossessed that she fights for, she has always had the freedom to make the choice. So have we. As Mahasweta says: "Independence is for our class. I belong to a privileged class. We have got education and everything. I am getting prizes. What have the tribals got? Nothing." When the camera or the recorder stops rolling at the protester or the protest, it is perhaps time to question if that that freedom and that precious privilege is getting wasted. In the abysmal silence of ignorance and apathy among the educated, something that Mahasweta has regretted all her life, even the smallest action counts.